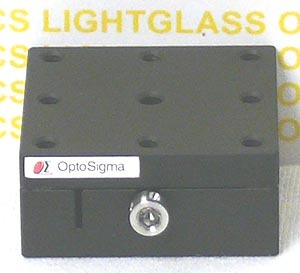 The OptoSigma 123-3380 40mm Single Axis Preset Dovetail Stage is a Set-and-Forget stage. The 40mm square top is drilled and tapped to accept inch fasteners. In use, the stage is adjusted to position with a hex wrench, then the dovetail stage is locked with a locking screw. This makes this brass stage very rigid. This makes it an excellent choice for setups where you want to set an optical element in place, lock it, then enclose it and not having to worry about it moving.